There are some very nice St Augustine churches in England, but something tells me that would be the wrong one! So we're in France ton make sure we've got St Augustine of Hippo, Doctor of the Church. 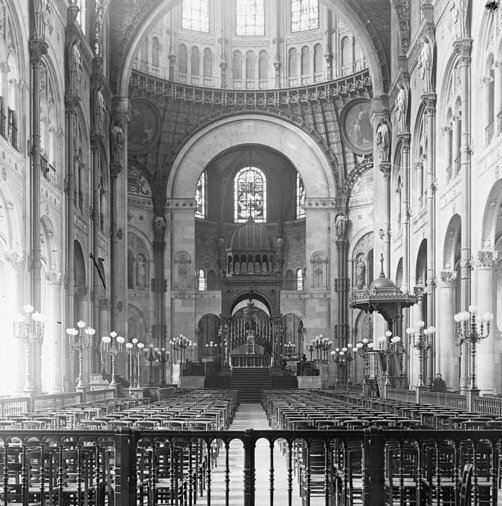 This is Église Saint-Augustin de Paris, with photos courtesy the Notre Dame School of Architecture library and their collection of creative commons published slides on flickr. The church dates from 1860-1871, which makes sense with its rather odd relationship to the streets on either side. 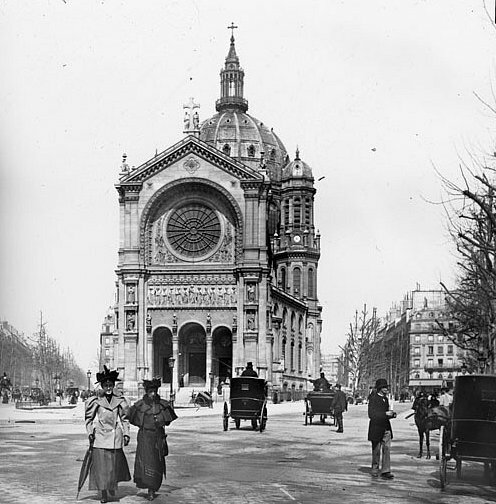 You get the feeling that the church defers to Haussman's avenues rather than dominating them in the manner of the nearby Opera or La Madeleine. As a result, it is not the frontal church to which we are accustomed in Paris, but a linear experience giving way to the beautiful central domes and this incredible altar.